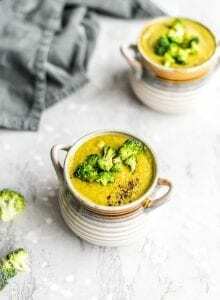 This healthy, vegan cream of broccoli soup is the perfect answer to cold fall days. All the flavour and nutrition with none of the fat and calories. It’s delicious, nourishing and comfort food all the way. Add the onion, garlic, carrots and celery to a pot with a few tablespoons of the vegetable stock and cook until they start to soften and become fragrant, about 6-7 minutes. Add the broccoli, stock and non-dairy milk and simmer over medium heat until all the veggies are soft and tender, about 20 minutes. Carefully pour the soup into a blender and process until smooth, or use an immersion blender in the pot. If you prefer it a little chunky, leave a few scoops of veggies behind in the pot the pour the blended soup back in to the pot and mix. Store in the fridge for up to 5 days or freezer for up to 5 months.